On Wednesday, May 16, 2012, the Boca Raton Beautification Committee selected the winners of their Annual Landscape Excellence Awards at a ceremony held at City Hall. The recognition encourages businesses, churches, homeowners associations and schools in the city limits to improve their landscaping and add to the beauty of Boca Raton. Lang Realty and Lang Management were proud to host a special luncheon for winners and officials following the ceremony. “Lang Management and Lang Realty salute today’s winners. We are proud to be the sponsor of the post awards luncheon and to have the opportunity to celebrate the beauty of Boca Raton.” remarks Kevin Carroll, President, Lang Management. 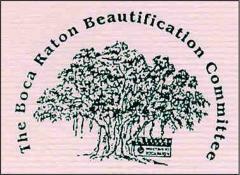 Interested in contributing to the landscape and beauty of the neighborhoods of Boca Raton? Read more about this local community effort at the Boca Raton Tribune online newspaper. This guest post has been provided courtesy of Lang Realty, a leading Boca Raton real estate broker. Lang Realty has eight office locations throughout Palm Beach and the Treasure Coast, including Boca Raton, Palm Beach Gardens, Downtown West Palm, Port St. Lucie, and Downtown Delray Beach. Are you looking to purchase a new home or property in Boca Raton? Please visit LangRealty.com for more information. 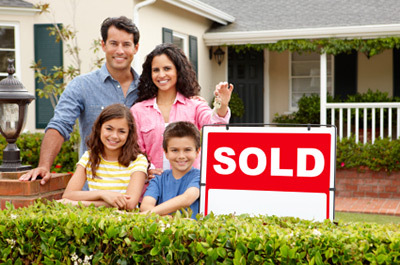 New Homeowners: Never Purchase a Home without an Inspection! 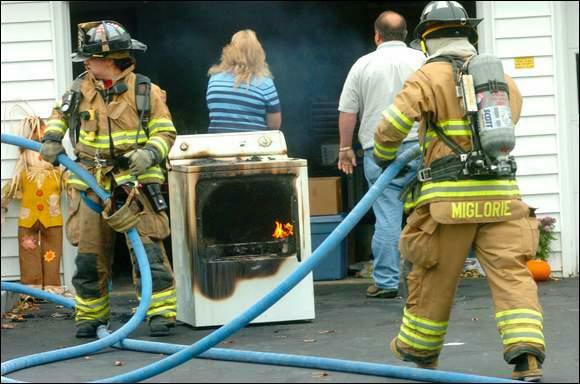 New home buyers need to exercise caution about the condition of the appliances in any home that they are considering purchasing. Unless the buyer is exceptionally knowledgeable, arranging an inspection by a certified home inspector is advisable. It is a rude awakening when the buyers move into their new home and are faced with high appliance repair or replacement costs. Your realtor will be happy to assist in finding a qualified inspector. The condition of the central air conditioning system is especially important. There are a few things that the buyer can do, but it takes an expert to accurately determine the condition. 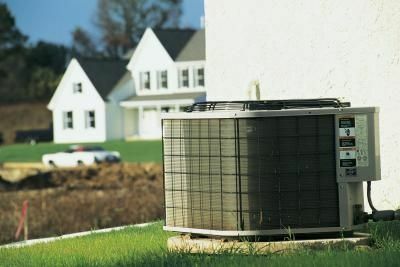 Air conditioner replacement can be as high as $5000; the cost could be $10,000 if duct replacement is needed. The buyer should check for noisy operation. An air conditioner evaporator cooling coil is usually installed inside the furnace plenum. The furnace fan is then used to direct the cooled air through the duct work to all the rooms. The fan can be noisy, but that is fairly inexpensive to repair. If the coils are dirty, a simple coil cleaning may be all the A/C system needs to start cooling properly again. A water leak around the furnace, while the air conditioner is operating, can be misleading. The air conditioner removes humidity from the home. The apparent leak may be caused by a plugged drain line and not be a sign of a larger problem. However, if the system continues to leak even while the air conditioner is off, than chances are the system needs to be seen and repaired by an A/C technician. Because of improper installation of the duct work, a high percentage of homes do not receive the benefit of the ability of an air conditioner to provide high-efficiency cooling. Many contractors install sub-standard duct work to increase profits. This may result in uneven heating and cooling of rooms. Uninsulated duct work that passes though the attic or garage can cause condensation and loss of cooling efficiency. Much efficiency can be lost by air leakage in the joints due to improper sealing. Ordinary duct tape can dry out and lose the seal. Resealing the joints can be extremely time-consuming. Ducts can be concealed under insulation and above false ceilings. The seller should provide copies of electric bills for the months that the air conditioner was used. A transferable manufacturer’s air conditioner warranty is a tremendous asset. 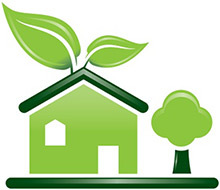 All air conditioners have a SEER rating, which means Seasonal Energy Efficiency Ratio. 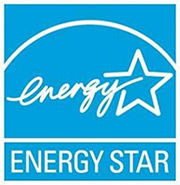 A higher SEER rating means lower electric bills. Before 2006, the government required a minimum SEER rating of 10. Now the minimum requirement for a “high-efficiency” air conditioner is 16. Some high-efficiency units are rated as high as 20+. Experts say that in warm climates that require a lot of air conditioning, the more expensive high-efficiency unit would probably be worth the extra cost. In cooler climates with minimal requirement for air conditioning, the savings on the electric statement may not justify the price difference. Sometimes there are power company rebates and federal tax credits that can reduce the price difference and change the benefit equation. The proper size air conditioner unit is essential. A too-small unit will cause continuous operation on unusually hot days. A too-large unit will cycle on and off very often and not reach the point of maximum efficiency. Short periods of operation will not allow the home to reach a uniform temperature in all rooms. A reputable contractor will not try to sell a unit that is too large for the home. Older units may contain refrigerants that cause degradation of the ozone layer of the atmosphere. Leakage of this gas is harmful. Newer units contain refrigerants that produce less ozone damage. The Carrier company is producing a unit containing the R134a refrigerant that does not damage the ozone. Other manufacturers are following suit. The two most common reasons for replacing an air conditioning unit are a complete failure or maintenance has become too expensive. The information supplied by a qualified home inspector will help the buyer to make an informed decision about buying a home, by factoring in the cost of correcting any deficiencies in the air conditioning system. Life in South Florida can be a lesson in an easygoing life, with lots of fun in the sun and no harsh, frigid winters. However, the very same sun that makes a day on the beach so enjoyable often combines with Florida humidity to make life a swelteringly hot and miserable existence once the temperature begins to soar. When it comes to living here, your central air conditioner is your best friend. 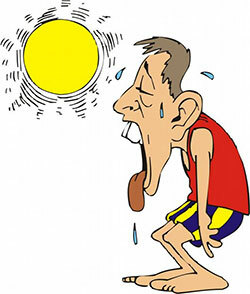 But if your A/C suddenly stops working, spending time in your home will quickly become a hot, sweaty inconvenience. While living in a home with a faulty air conditioning system can certainly still beats life with no A/C at all, that relief will quickly end once your air conditioner stops working altogether. If your house is suddenly hot and sweaty and your air conditioner is not putting out any cool air, or if your a/c is leaking water it is time for a little air conditioner 101 before the problem gets any worse. Start with the A/C power. It may seem too obvious, but many times the air conditioner is not working because it does not have power. Check the power cord and make sure the electrical plug is fully pushed into a working outlet. Inspect other appliances plugged into the same outlet and if they are not working either, then replace or reset your fuse or circuit breaker. Stop while the air conditioner is turned off, open the front panel to where the air filter is housed, and remove the air filter. You can either replace the filter with a new one from your local hardware store or clean the old one by vacuuming it or washing it with soap and water, then rinsing it and letting it dry thoroughly before you slide it back into the air conditioner. 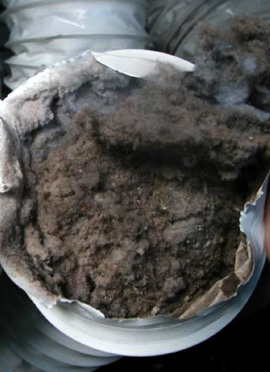 A clogged air filter can really slow down or even stop air conditioner performance. Now that you have a clean air filter, shut the access panel, look to see if the cord is plugged into a working outlet, and make sure the main power switch on the air conditioner is turned to “On”. There may be more than one “On” switch on the unit, so check the system thoroughly for switches. While you are at it, make sure the front panel of the unit is shut firmly, as most units will not function if the access panel is open. Next, move to your thermostat. Make sure the settings are placed at “On” or “Auto Cool” and the temperature is set to a point that is at least 10 degrees below the current outdoor temperature. If the fan is set to “Heat” or “Off”, then your air conditioner is not broken, it just needs to be set to cool correctly. Note: Turning up your thermostat a couple of degrees while you’re not home helps to prevent maintenance problems and can also help you save on energy costs during the summer. Give the air conditioner a few minutes to turn on once you have set the thermostat to “Cold” and the temperature down, then walk around and check all your vents and registers to make sure that they are all open so cool air can move around the house. If you still aren’t getting cold air, head outside and make sure the cover on the outdoor unit has been removed, since airflow is essential to proper function. In addition, make sure the unit power switch is turned to “On” and look around the outside unit for signs of damage, clogs due to leaves or other debris, or leaks around the unit. 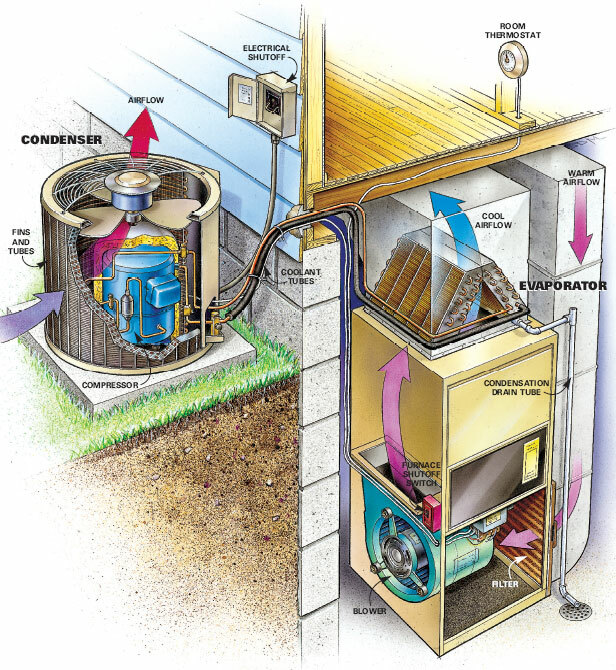 If you find debris or other items that may be blocking the condenser coil, turn the system off and let it cool and stop completely, then clean the debris from the outside of the unit and turn it back on. If you see signs of damage or leaks, turn it back off and call a repairperson for assistance. If you cannot identify why the air conditioner is still not working, you can try some of the more sophisticated repair attempts as suggested on Inspectapedia.com, but you are probably best off calling for a Boca Raton AC repair person for help. Every three to six months, remove and clean the air filter and make sure the access panel is shut firmly when you are done. Check the outside unit for any items that have blown into the unit, potentially blocking the condensing coil. It is best to keep the area around the unit clear of bushes, leaves and other items that can easily enter the air conditioner and cause trouble. Put a cover over the outdoor unit when it is not in use. Run the air conditioner for a few minutes after you have performed your regular maintenance to make sure everything is working fine, and then turn it back off. During the summer, set your thermostat to “Auto” and raise the temperature at night or when you are not at home, so that the unit only needs to run as needed. If you leave the thermostat at “On” or “Cold” and set at a chilly temperature 24 hours a day, you run a greater risk of burning the unit out. 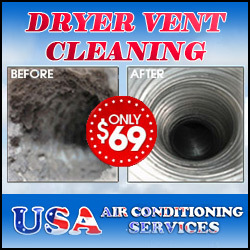 USA Air Conditioning Services offer same-day emergency service for broken air conditioners seven days a week. If your A/C is not cooling and you need help now, schedule your service online or give us a call today at (561) 404-0340. There are a number of reasons that can cause an air conditioning system to leak water. Some are easily fixed, others are more complicated and some water draining out is actually a normal part of operation. The trick is knowing what is normal and what is an indication of a bigger problem. During normal operation, your air conditioning system will be removing moisture from the air inside the home. This moisture will condense on the A/C coils and then drain down and exit through a drain hole at the bottom of the machine. 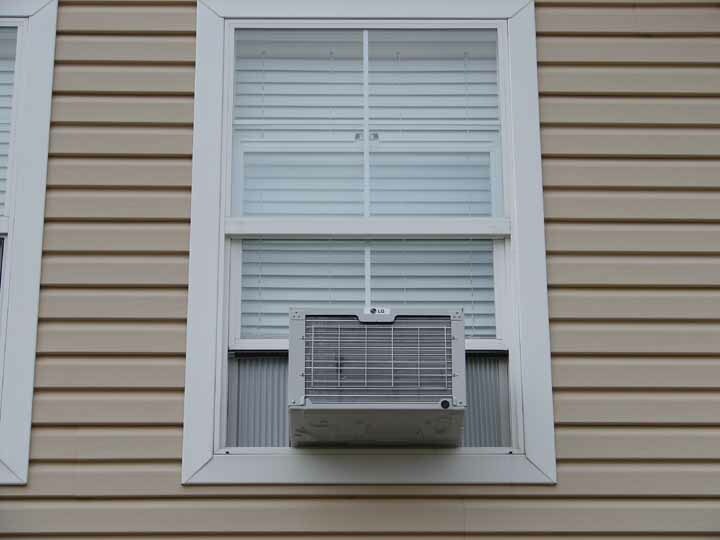 Some A/C window units have a groove in the base pan that leads the water outside rather than a drain hole. Either way, there is always a means for water to drain out of the machine. 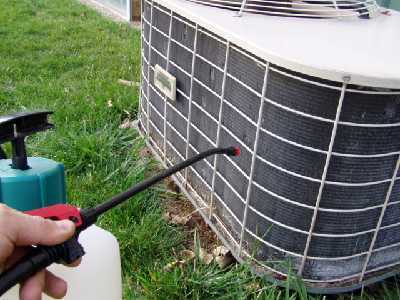 If you see a small amount of water coming out of a pipe leading from your air conditioner when it is on, this is probably normal condensation and is nothing to worry about. If the water is coming out from somewhere other than the drain, or if it is excessive, then there is a problem. Regardless of whether you hire an A/C company or choose to fix the leaking yourself, running your A/C system while it is leaking water will only worsen the problem and reduce the efficiency and lifetime of your central air system. One reason for water not making it to the drain and flowing into the room instead is the installation of the A/C. An A/C must be tilted slightly backwards toward the outside, so that water will flow toward the drain. If it is installed incorrectly and tilts inward or is level, water may drip into the room. If your A/C is tilting inward, call a repair person and have it reinstalled correctly. Algae and other material can accumulate in the pan and clog the drain. 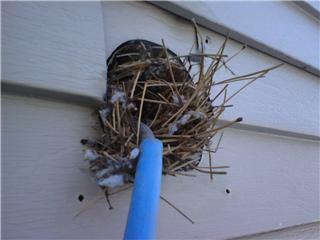 A clogged drain is often the reason for an A/C leaking. The drain can usually be cleaned out by flushing with water or vacuuming, but making sure the power is off at the breaker is extremely important for avoiding dangerous accidents while cleaning an A/C drain. When your air conditioner is running constantly (or in rare cases when the outside temperature in Florida gets below 60º Fahrenheit), ice can form on the coils and then melt causing water leakage. Turning off the A/C every couple of days to allow your system to is the best solution for avoiding this problem. Another installation factor that can affect water leaking from an A/C is not having a good seal around the unit where it goes through the wall. If warm air leaks around the machine and then meets cooler air inside the house, condensation can happen in the wrong place causing leakage into the house, or outside along the wall. Installing a foam sealer around the unit and creating a tight seal will solve this problem. Having your A/C serviced regularly by a professional is one way of preventing water leakage problems in the first place, but chances are, you’re reading this article after the fact. Our A/C techs offer same-day service call for A/C repairs in Broward and Palm Beach county. Need service now? Give us a ring at (561) 404-0340. If you have an air conditioner helping you stay cool during Florida’s sweltering hot summer months, you can significantly reduce your energy and repair bills by doing a few regular maintenance tasks. Florida’s high heat and humidity levels can easily result in skyrocketing electric bills, even in late fall! Taking a minute to check your A/C system and doing some basic maintenance can help shave off quite a bit of money off an otherwise costly energy bill. Keeping up with maintenance can also increase the life and efficiency of your air conditioning system, saving you more money over the years. Many people choose to save money on expensive air conditioning service costs by doing their own basic maintenance on their window units and central air conditioning systems. This is a common practice to which entire Do It Yourself forum communities have dedicated tips and instructions for the motivated home owner. Taking care of your A/C is not hard and does not take a lot of time. But it will be time well spent, especially if your air conditioner is running a lot during the summer. You don’t need any tools to do the job, just a little common sense and a few minutes of time. First, if you are unsure about how to do these tasks, talk to a professional A/C technician and have him show you what needs to be done. Then, you can do it yourself the next time. If you have a manual, that can be a useful resource, too. Whenever you do any maintenance on your A/C, start by turning off the power at the thermostat and also the breaker switch (pictured below). Note: While examining your A/C system and opening the unit, be careful not to injure yourself on any sharp metal edges that might be inside your air conditioner when you take the cover off. One of the easiest and perhaps most important maintenance jobs is to check the filter and see if it needs replacing. The filter should lift out without the need for any tools. Once you have it out, hold it up to the light and see if there is dirt, dust, or pet hair clogging it. You should be able to see light through it. If not, it is time to change it, or wash it if it is reusable. Changing the filter in your A/C should be done at least every three months when it is in service. For pet owners – especially those with long-haired cats or dogs – changing the A/C filter every month or other month is a must. Dirt particles from the air are trapped in the filter and will cause the machine to work harder, requiring more energy and raising your electric bills. In Florida, a clean A/C filter is the key to reducing indoor air humidity, which is hampered by dirt and debris. By keeping the filter clean, you can save as much as 25 percent on energy bills during months when the A/C is in operation. Its a good idea to have a spare filter on hand before you need one. Publix and other major grocery and convenience stores typically carry disposable filters of all sizes, as well as pet-dander and allergen specific models. If you are running your air conditioning system everyday, check the filter more frequently, especially during the summer months. In areas with heavy particulate matter in the air, a filter can clog up in as little as two weeks. The next maintenance task is to look at the coils and fins on the unit. The A/C coils are typically protected by a grill that has been screwed in, so keep a screwdriver handy for easy removal. Once you have exposed the coils on your air conditioner, softly brush them from side to side to remove any built-up dirt or leaves. Tip: use a hand clipper and cut away any bushes or plants that are touching the unit. Also, be careful not to apply too much pressure to the coils, or bend them in any way, which could damage your air conditioning system. Also check to see that water is coming out of the drain when the A/C is operating. If it is not, call your repair person for help. Freon is the stuff that’s responsible for keeping the air that is blowing from your system nice and cold. Too little of it and the air in your house will remain stagnant and warm, regardless of what temperature you set your thermostat to. When it comes to A/C maintenance, taking care of the freon is an advanced task that is better left to the professionals. Under no circumstances should you consider recharge or flush your refrigerant lines without the proper tools and expertise. However, a quick check up to make sure everything is working the way it should be is a simple enough task. A/C coolant line insulation can become worn or damaged from prolonged outdoor exposure, and is easy to see. Regardless of whether you hire an A/C company or choose to do the maintenance yourself, regularly checking the condition of your A/C system can greatly extend the lifetime of your system, in addition to maximizing efficiency and reducing energy costs. Having a professional air conditioning technician service your A/C each year, along with these fast and easy maintenance tasks, will keep your cooling system running efficiently for a lot longer. You will stay cooler yourself, too, in more ways than one. 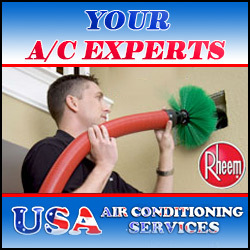 Need help with your air conditioner? Located in Palm Beach county? Give us a ring at (561) 404-0340 or click here to schedule your service call with us. We offer quick, professional same-day service and can help with maintenance, repairs and even new installations.